As sure as night follows day, there will always be another Ancient Rome-themed slot around the corner if you've gotten bored of the other 365,000 Ancient Rome-themed slots doing the round. 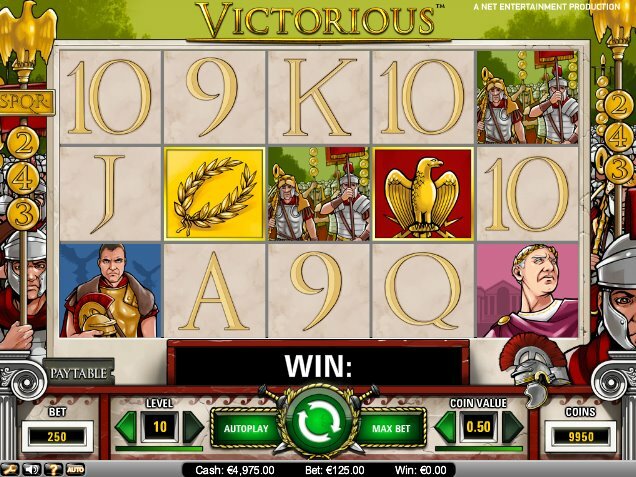 Victorious is creative slot developer NetEnt's addition to the growing toga party, and its simplicity is probably its best feature. In fact, in place of big bonus features we get a generous Wild and some very generous scatter-triggered free spins. The slot is a 5 reel, 243 ways to win game, so NetEnt have thrown in the 243 ways system to offer even more chances to win. The betting range is pretty good for all pockets, and the jackpot sits at $7,500. 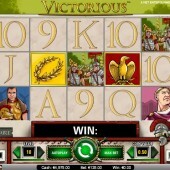 Playtech’s sword and sandals-themed Gladiator, based on the Russell Crowe epic of the same name, and WMS’s Roman-themed slot, Riches of Rome, both plowed similar ground to good effect, so you kind of know where you are with Victorious. Images of Caesar, centurions, eagle statues and laurel wreaths fill the reels, as well as some Latin-looking card symbols. The Wild is the golden eagle, and interestingly substitutes for every symbol in the game - even the scatter. The scatter is the laurel wreath, and this is where things get interesting. Get three or more scatters on the reels and you'll trigger some free spins. So far, so boring. However, that's until you see how many free spins are on offer: three scatters gets you 15 freebies, four scatters 20 spins, and five scatters a whopping 25 free spins. In addition, every win during the free spins is trebled. Fans of Ancient Rome will probably want to look elsewhere for their fill of the Coliseum but if you're after some cheap, simple fun with an emphasis on generous freebies, Victorious will probably pass the time efficiently enough. Perhaps not a complete thumbs-down from the Emperor, but not a resounding victory either.